Now that winter has finally departed, it is time to plan some outdoor hikes. Let me recommend climbing Mount Kearsarge in Warner so you can check out one of the state’s most interesting bits of graffiti, a carving that celebrates the plane-geometry precision that created the first accurate map of New Hampshire. If you really want to get into the spirit of things, bring a 15-foot pole painted black and white; a theodolite, which is the angle-measuring thing that surveyors use; and an empty nail keg covered in black paper. Puzzled? So was I when I stumbled across the carving last summer atop the lovely 3,000-footer of a mountain. The ledges on Mount Kearsarge’s exposed top are full of carved names and initials, most dating back to the 19th century, but one stands out. It is a carefully carved square, a sort of embossed plaque, that lists “Prof. 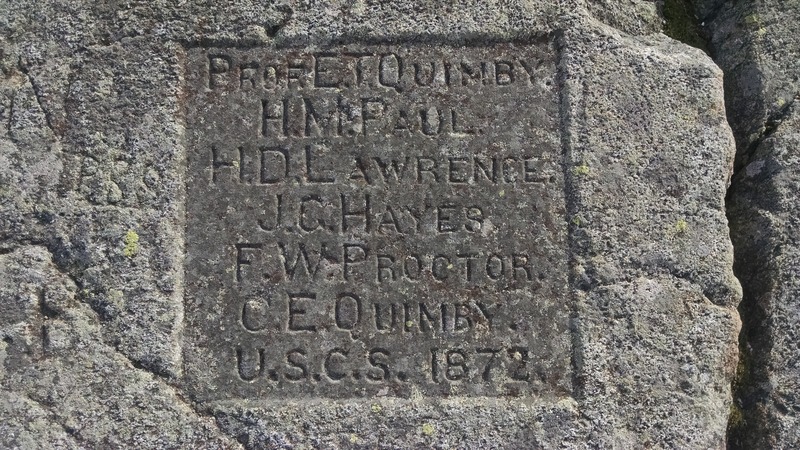 E. T. Quimby” and six other names plus the mysterious initials USCS and a date: 1872. I was baffled. Had I been accompanied by Brian Burford, the New Hampshire state archivist, all would have been clear. “Yes, I do know about it. We have Quimby’s notebooks!” Burford said over the phone – almost shouted in excitement – after an online search led me to his doorstep. Burford invited me to the state’s Archives and Records Management building on South Fruit Street in Concord. There, among more than 90,000 boxes of documents and reams of incredibly important historical documents are a few dozen small notebooks full of penciled notations about angles and distances and locations. They were compiled by Elihu T. Quimby, a geography professor at Dartmouth, plus various students and assistants starting in the 1860s. Here’s the background, as explained by Burford. 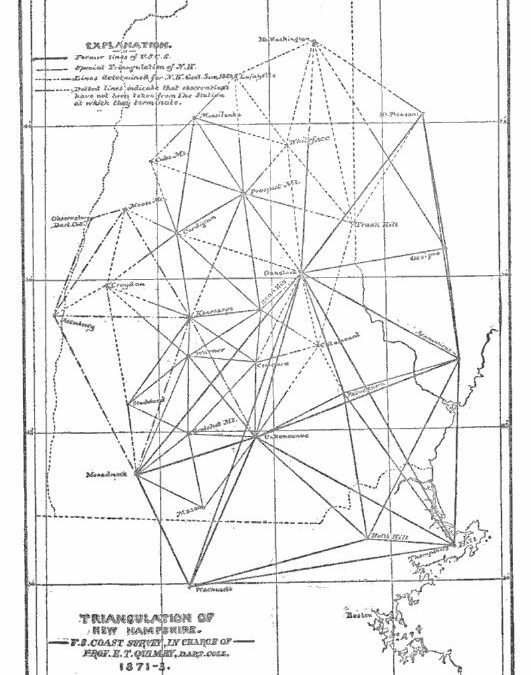 For the first couple of centuries, maps of New England were based on measurements made during trips in which latitude and longitude were measured by solar observations as you traveled, and points were connected via compass readings. These are fine for local information – the Mason-Dixon Line was created with this method, Burford said – but are hard to combine into a comprehensive map. After the War of 1812, the U.S. government realized we needed better maps so ships wouldn’t keep hitting rocks, and the U.S. Coastal Survey was formed, which explains the mysterious USCS on our plaque. Admittedly, Warner isn’t very coastal, but Burford said “mission creep” expanded the project as the value of accurate maps became obvious even for inland areas, and eventually USCS became USGS, the U.S. Geological Survey, which still exists. In 1839, New Hampshire Gov. John Page signed “an act to provide for the geological and minerological survey of the state” and Quimby, a professor of geography, got the mapping portion of the job. Fine, but why did he use an inconvenient place like a mountaintop? The key to making these maps is triangulation. It is still the standard method for determining the location of a distant spot – it’s even used by satellites that provide our location via GPS. To triangulate is to create a triangle using something you’ll recall from high school: The angle-side-angle theorem. In geometry class, this theorem said that if you know the length of one side of a triangle and its two associated angles, you could uniquely determine the triangle, or show whether one triangle is congruent to another one. For surveying, however, this theorem means that if you know the length of one side you can use the angles at each end of this line to determine the distance to a far-away point. Here’s how it works: Very carefully measure the length of one line, called the baseline. Then choose a distant point – the easily visible peak of a prominent mountain like Kearsarge would be good – and measure the angle to that point from each end of your baseline. Now you have an angle, a side and an angle, allowing you to calculate the distance to that distant point and create your first triangulation triangle. Next, take the two new sides of the new triangle and use them as baselines for measuring the angles to other easily visible places, such as Mount Uncanoonuc in Goffstown or Crotched Mountain in Francestown. That gives you two more triangles you can use to measure yet more triangles stretching to Mount Monadnock or Mount Washington or other prominences. Continue this over several seasons, as Quimby’s team did, and you’ll eventually cover New Hampshire with a mesh of triangles that can be honed over time and will eventually produce the USGS quadrangle maps that are still used today. Take this contraption to the top of your selected point and set it upright, Hitchcock wrote, adding: “Too great care cannot be taken to place the pole exactly vertical and to secure it from being moved by winds, cattle, or any other cause.” A black keg atop a striped pole was relatively easy to see from 10 or 20 or 50 or miles away. The fact that he’s worried about cattle, incidentally, reflects how 19th-century New Hampshire was practically one huge pasture. Most of the trees south of the White Mountains had been removed to create fields where sheep, cattle and other animals could graze. Quimby’s notes say that in October 1869 his team used this system to make measurements on six mountains, including Kearsarge, “although the weather was very unfavorable,” using a 10-inch theodolite from Thayer School of Engineering at Dartmouth. By 1874, he had done a dozen locations, and eventually he covered twice as many. These mountaintop measurements were the important framework for the resulting triangulation maps, but not the whole thing. Quimby’s notebooks are filled with angle measurements from each of these mountains to specific places inside the big triangles. And I do mean specific, including “the ridgepole of big barn” at Shaker Village in Canterbury and the “gold ball atop dome” of the State House. I even found an 1871 notebook that lists the angle measurement from Crotched Mountain to a barn that still stands in my town. Need I say how cool this is? 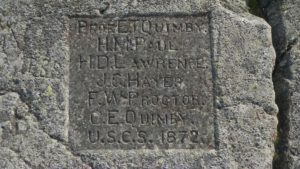 Quimby might not be remembered today by people like me, but his work lives on, especially for people like Burford, who is not only a history-minded state employee but a licensed surveyor who has wielded many a theodolite in his time. And it’s worth celebrating. So next time the outdoors beckons, consider heading to Winslow or Rollins state parks and hoofing it up Kearsarge to celebrate a bit of New Hampshire history. And be glad you don’t have to carry a nail keg while you’re doing it.